Lethal Inheritance has won the Awesome Indies Seal of Approval. The author, Tahlia Newland gave me a copy of Lethal Inheritance in exchange for my review. Lethal Inheritance is a contemporary young adult fantasy that rivals such young adult favorites as J.K. Rowling and Rick Riordian. Newland presents the reader with a hidden world that lives within the pages of her novel. Readers encounter new creatures and challenges as Ariel faces them. Newland’s writing style is vivid. I was hooked from the moment Ariel watches as her mother is kidnapped. The brilliant economy of words employed by Newland in conveying the event magnify the terror felt by a girl in hiding and her mother who does not know what has become of her. Helping Ariel are key characters into whose consciousness we venture. Nick is strong and only confident in the fact that he has a magical ability that is too big to control. Nick is a very unsure character and as Ariel builds a connection with him, so will the reader. Walnut supports and guides Ariel to learn to trust in herself and save her mother. Each character conveys honest and direct emotions with which an older child will be able to identify and of a depth that will be able to satisfy any adult. Newland provides us with a depth to even the briefest of encounters. The plot is wonderfully direct and action packed. Ariel is on a journey that will lead to a battle between good and evil. 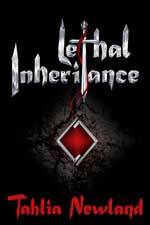 Despite its 358-page count, Lethal Inheritance‘s action packed story line made for a quick read. There was never a point where this reader had to look back and wonder how we had gotten to a certain point; Newland clearly lays out her story. Newland’s settings are so rich and wonderfully described that a reader can feel as though they’re approaching Diamond Peak. I would be remiss to not mention the baddies. As a reader, I love a good baddie and Newland’s are wonderful. How do you fight a demon that feeds on fear? At the start of novel when the mother is being kidnapped, Newland describes her baddies as purring as they feed on fear. The visual that brings is deliciously horrifying. Lethal Inheritance is an excellent fantasy novel for children ages 12 to 120. For more information about Tahlia Newland and her work visit her website. You can connect with her on Goodreads, Facebook and Twitter @TahliaNewland.